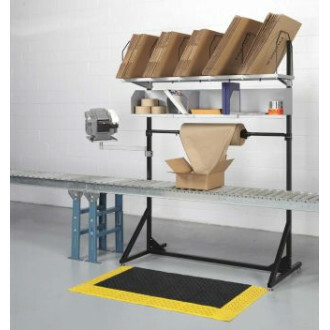 Complete packaging center for small packages that fits above any conveyor system. Includes the paper roll holder and under table top paper cutter. •Top carton shelf hold 6 dividers for 5 different sized boxes or envelopes. •Carton shelf is 15-1/2" D x 64- 3/4"W each wire support is 16" H.
•Middle document shelf is 64" x 9" x 9-1/2"H and perfect for packing supplies, envelopes and informational binders. •Center paper roll holder for stuffing packages or wrapping. •ï»¿Tape dispenser tray swivels for handy easy access .